Main File Only Menu Options. The Main File menu options only apply to the Main Editor. 1. New. Clears the Main Editor and inserts the necessary main procedure and code declarations to start a new XPL project. 2. Open. Displays the standard Windows File Open dialog box, which lets you open any XPL program file in the Main Editor. 3. Reopen Main. The program saves a list of the last 12 files that were opened in the Main Editor. These 12 files are displayed under the Reopen option. Clicking on any of the files in the list opens that file. This saves the hassle of searching around your hard drive to find a recent XPL project. Both Main and Auxiliary Options. Some file operations apply to either the Main File or an Auxiliary File, depending on which tab is selected. 1. Save. This option saves the content of the currently selected editor. If the file already exists and already has a name, the file will be saved under that name. If the file has not been saved before and does not have a name, the program will revert to the behavior described under the Save As option described below. 2. Save As... Displays a standard Windows Save As dialog, which lets you save the content of the currently selected editor under any name and in any directory. 2. Save All. This option saves the content of any editor whose text has changed since the last time it was saved. It saves both the Main file's content and any Auxiliary file content. If a file doesn't have a name, the program reverts to the Save As behavior described above. 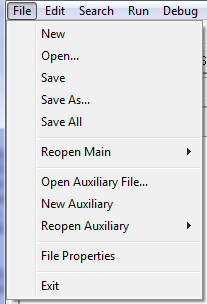 Auxiliary File Only Menu Options. Auxiliary File operations only apply to Auxiliary Editors. Each time an Auxiliary File is opened, it is given a new tab-page. This way, you can have an unlimited number of auxiliary files open at the same time. 1. Open Auxiliary File. Displays a standard Windows File Open dialog box, which lets you open any XPL program file in a new Auxiliary Editor. 2. New Auxiliary. Creates a new, blank file in the Auxiliary Editor. 3. Reopen Auxiliary. The program saves a list of the last 12 files that were opened in the Auxiliary Editor. These 12 files are displayed in a list under the Reopen option. Clicking on any of the files in the list opens that file. This saves the hassle of searching around your hard drive to find a recently opened file.